When you are faithful you are loyal, unwavering, and reliable regardless of circumstance. Apart from God we would not know what faithfulness is because faithfulness comes from the Lord. Take a second to examine your life and ask yourself, are you being faithful to God? Being faithful in the small things. As we wrap up the end of the year, lately God has been leading me to pray for more faithfulness in the little things. This is something that we all can struggle with, but we never notice that we struggle with it. Don’t you realize that God in His sovereignty has placed people and resources in your life? He has given you friends, a spouse, neighbors, unbelieving co-workers, etc. who will only hear Christ through you. He has given you finances to be used for His glory. He has blessed us with different talents to bless others. Have you been faithful in these things? Have you been lazy in your love towards others? We all want to be promoted without moving a finger. We want to go to a different country for missions, but are we involved in missions in our own country? If you’re not faithful in little, then what makes you think that you are going to be faithful in great things? We can be such hypocrites at times, myself included. We pray for opportunities to share the love of God and give to others. However, we see a homeless person, we make excuses, we judge him, and then we walk right past him. I have to continually ask myself, am I being faithful with what God has put in front of me? Examine the things that you’re praying for. Are you being faithful with the things that you already have? Be faithful in little and allow God to prepare you for greater things. Sometimes before God answers a certain prayer or before He has a greater opportunity for us, He has to mold our character. He has to build experience in us. He has to prepare us for things that might happen down the line. Moses worked as a shepherd for 40 years. Why was he a shepherd for so long? He was a shepherd for so long because God was preparing him for a greater task. God was preparing him to one day lead His people to the Promised Land. Moses was faithful in little and God increased His talents. We tend to forget Romans 8:28 “And we know that for those who love God all things work together for good, for those who are called according to his purpose.” Just because something doesn’t fit your agenda does not mean it’s not from God. It’s foolish and dangerous to think that a small assignment is not from the Lord. God has to develop your character first to match the assignment. Our flesh doesn’t want to wait. We want it to be easy and we want the greater task now, but don’t neglect the mighty work that He has to do. Some people put themselves in a position that they were never called to and it doesn’t end well for them. You can end up hurting yourself and hurting God’s name if you don’t allow Him to prepare you first. By faith, this should give us so much comfort to know that we are being prepared for something greater. I don’t know about you, but this gives me goosebumps! I’ve noticed in my own life that there is a recurring pattern/situation that I’m put in to help me with the things that I know I need to get better in. I know this is not a coincidence. This is God at work. Look for that pattern in your own life to see what God is changing about you. Look for similar situations that you notice that always arise. Also, let’s not go overboard. I’m not referring to sin because God does not tempt us to sin. However, God might ask you to get out of your comfort zone to grow in a certain area and to better advance His Kingdom. For example, I used to struggle with praying in groups. I noticed that there was a pattern of opportunities that started arising in my life where I had to lead group prayers. God helped me in my struggle by taking me out of my comfort zone. Always remain faithful and make sure that you quickly join in God’s activity. Being faithful by giving thanks. We tend to take everything for granted. One way to remain faithful and to be faithful in little is to continually thank God for the little that you do have. Thank Him for food, friends, laughter, finances, etc. Even if it is not much thank Him for it! I was so blessed by my trip to Haiti. I saw poor people that were full of joy. They were thankful for the little that they do have. In the United States we are considered rich to them, but we are still unsatisfied. Why? We are unsatisfied because we are not growing in gratitude. When you stop giving thanks you become discontent and you start to take your eyes off your blessings and you turn your eyes to someone else’s blessings. Be thankful for the little that you do have which creates peace and joy. Have you lost sight of what God has done in your life? Do you still look back on His past faithfulness to you? Even if God didn’t answer a prayer in the way that you wanted, be thankful for how He answered. Imitate Christ and do God’s will no matter what. When we look at the life of Christ we notice that He was never empty. Why? He was never empty because His food was to do the will of the Father and He always did the will of the Father. Jesus was continually faithful in all situations. He obeyed in suffering. He obeyed in humiliation. He obeyed when He felt alone. Just like Christ we have to be faithful and stand firm in tough situations. If you have been a Christian for a long time, then you have been in situations where it was hard to serve Christ. There have been times when you felt alone. There have been times where it was hard to obey and not compromise because sin and sinful people were around you. There have been times where you have been made fun of because of your faith. In all of the difficulties that we may face we must stand firm. The love of God drove Christ to keep going and in the same way the love of God drives us to continually obey when it gets tough. If you’re currently involved in a tough trial, remember that God is always faithful to His faithful servants. I often find myself quoting Matthew 9:24. “I believe; help my unbelief!” Sometimes we can all struggle with unbelief. Why should God care for a people like us? We sin, we doubt Him, we doubt His love at times, etc. 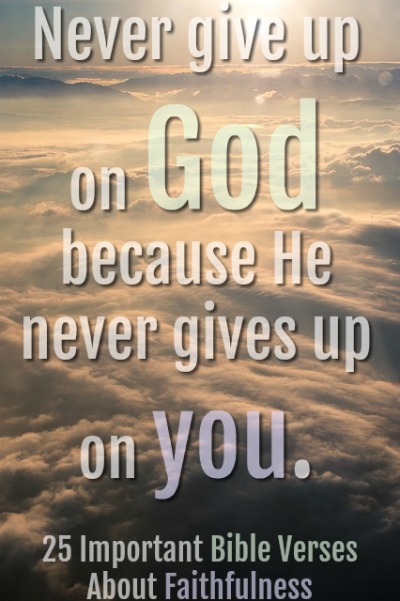 God is not like us, although sometimes we may be faithless God is always faithful. If God is who He says He is and He has proven to be faithful, then we can trust Him. The mere fact that God is faithful should lead us to be faithful to Him. Are you wondering how to be faithful? Once someone puts their trust in Christ and becomes saved the Holy Spirit immediately dwells in that person. Unlike other religions, Christianity is God in us. Allow the Spirit to lead your life. Yield yourself to the Spirit. Once this happens being faithful is not something that is forced. Being faithful is no longer accomplished legalistically. The Spirit produces faith so being faithful becomes genuine. It’s so easy to do something out of duty rather than love. When we yield to the Spirit God’s desires become our desires. Psalm 37:4 – “Take delight in the LORD, and he will give you the desires of your heart.” One of the most important aspects of being saved is getting to know and enjoy Christ. Through Christ you have been saved from the wrath of God. However, now you can begin to know Him, enjoy Him, walk with Him, have fellowship with Him, etc. Once you start becoming more intimate with Christ in prayer and once you get to know His presence, your faithfulness to Him will grow along with your desire to please Him. To be faithful to God you have to realize how much He loves you. Remember how He has been faithful in the past. You have to trust and believe Him. To grow in these things, you have to spend time with Him and allow Him to speak to you.